Ash by Malinda Lo. Little, Brown. 2009. Reviewed from ARC. From BEA or ALA, not sure. The Plot: A Cinderella retelling. Aisling, nickname Ash. Mother dies, father remarries to woman with two daughters, father dies, stepmother turns Ash into a servant, the Prince is looking for a wife, there's a ball, with fairy help Ash attends the ball. You know the rest. Or do you? The Good: This retelling unfolds slowly, deliciously. It's an internal story; a story about Ash grieving the loss of her parents, shutting down from it, and eventually choosing life and love. This is a tale about recovering from grief and unbearable loss. Cinderella has a fairy godmother, right? So it's only logical for Lo to create a world where fairies are real. They are dark and dangerous; the fairy world where girls risk enchantment and death for dancing and eating with these other-worldly folk. In Ash's time, fairy tales are viewed as stories to be told, except for a handful of people who still believed and followed other old ways. Ash's mother was one such; but not her father. Ash, 12 at her mother's death, believes that somehow, the fairies and her mother are connected; and that if she joins the fairy folk she will be reunited with her mother. This belief grows both with the death of her father and with her meeting those that she sought -- the fairy. Yes, they are real. The metaphor here is obvious; joining the fairies will be a death, a rejoining with her parents. Her life as servant is so devoid of love, of anything, that this choice is not grim. In fact, as Ash reads fairy tale after fairy tale (Lo includes a number of them, all haunting) she is comforted by the promise of being lost to the fairy world, even when those tales are cautionary ones to keep young girls away from that world. Here, Ash is thinking about Sidhean, the only fairy we meet by name, who revisits Ash again and again, promising that eventually she will join his people. "[Ash] felt the distance between her and Sidhean for the first time, and it made her long for him. She turned over onto her side and closed her eyes, trying to force herself to sleep. But in her mind's eye all she could see was him, and she wanted to be with him, all of his cold strangeness." His cold strangeness; her death. Part 1, The Fairy, is about her obsession and longing for this strangeness, this escape, this reunion with the dead; Part 2, The Huntress, begins when Ash is 18 and is about her slowly coming alive again and wanting the living world. Instead of Ash and her books and her fairy stories, there is Ash getting to know other people (servants at another house), exploring the Wood, and meeting Kaisa, the King's Huntress. Ash has been called a lesbian Cinderella; it says so right on Lo's website and it's also how I heard it pitched to librarians and reviewers. So I'm not giving much away when I say that Ash does not want Prince Aidan; she wants Kaisa. Another twist is that Sidhean is the fairy who helps Ash attend the Ball, fairy godfather rather than godmother. Considering the Ash/Sidhean relationship, I'd call this more a bisexual Cinderella. Ash's friendship with Kaisa begins slowly; they meet in the Wood. They talk. Ash looks forward to meeting Kaisa; but, in part because of her connection to Sidhean, doesn't realize the depth of her feelings for Kaisa. It's someone else's observance that makes her realize it: "She wondered uncomfortably if she had done something to suggest it. And if she had -- did she feel that way? The idea was unsettling; it made her feel vulnerable." Note it's unsettling not because "I'm in love with a girl;" it's unsettling because it makes Ash vulnerable. Vulnerable to life, to love, to feeling, to not having her feelings returned. In Ash's world, no one looks askance at the thought of a female/female pairing. While we don't see another such couple in the book, in all honesty, Ash's world is so limited by being a servant that she doesn't see many couples at all in the book. This makes the story a "falling in love and recognizing love" story, not an issue story. Which is awesome. I'm a bit of an author junkie, even though I know the book should stand alone. Still, after reading a book, it's fun to discover via a website more about the author. When I read The Devil's Kiss, I found that Sarwat Chadda is very, very funny. After Carter Finally Gets It, I visited Brent Crawford's website and found some fascinating information on jeans and the denim industry. Here, at Malinda Lo's website, I found she's an entertainment reporter and other fascinating stuff. Edited to Add: Colleen at Chasing Ray on Ash. Colleen & I had a great email back & forth on this (much, much too rough to go public with; rather the type of intense conversation that would have been great in person!). I love when she says, "This very subtle take on the story is much more about the emotion of grief then love, which is something Disney clearly missed." 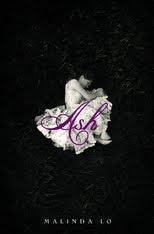 In many ways, Ash was a deceptively demanding read because it was such a different take on the fairy tale. Take note, librarians and teachers looking for a great book with both literary merit and one that encourages deep discussion; you'll want this one! And I cannot wait to read what Colleen says about this for her Bookslut column. This one's in my TBR pile. I believe it's going to move much nearer the top. I actually struggled with this book. The two sides made me feel a bit of the rope in tug of war. Now, when I received this book I had *no* idea that it was a lesbian retelling of Cinderella's story I was expecting it to be a fairy tale in the stereotypical sense of the word -- boy and girl ride away in their carriage of love -- so I was struggling to find the chemistry between Ash and Sidhean and then between she and Kaisa. It felt forced to me on both ends. But reading this review gives me pause for deeper thought as I was looking at this story as one about that fairy tale love story one where she already knows what love is and strives for it as compared to it being a story of learning about love and trying to recognize it in her own life. Thank you (once again) for giving me that additional and different perspective it has actually changed my opinion on the story. Interesting review. Courtesy of Maeve Binchy, I do remember that Aisling is pronounced Ash-ling. Kelly, you'll have to let us know what you think. Michelle, when I first began this I had a very "what is this? where is it going? why isn't it what I think of for Cinderella"? Then something shifted -- and it was like OH. THAT's what is happening here, and wow, what an exploration of grief! CLM -- Light a Penny Candle. Sigh; my first Binchy, so my favorite.